Franco was diagnosed with thyroid cancer in 1999, when she was a junior in college. During a routine physical in her small Connecticut hometown, Franco’s doctor found a lump in her thyroid. A surgical biopsy revealed that she had thyroid cancer; luckily, they had caught it early. After enduring two surgeries and radioactive iodine treatment, Franco recovered, but her perspective on life had changed. Franco on a family trip to Disney World. Franco decided to pursue this new interest through a PhD program in cancer biology at Vanderbilt University, but as a student there she avoided researching her own disease – she was afraid to learn too much about it. Although thyroid cancer has a very low mortality rate when caught early, it also has a high rate of recurrence, even decades after the initial diagnosis. Franco wanted to move beyond her cancer diagnosis, and felt this was not possible if she was investigating the disease every day. Instead, she wrote her thesis on gastric cancer. 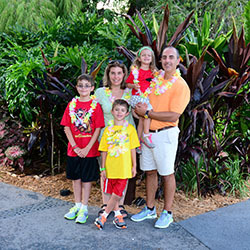 As she was preparing her dissertation at Vanderbilt, Franco knew she wanted to switch gears for her postdoctoral training and investigate more molecular and genetic causes of cancer, though she never dreamt it would lead her back to her own disease. While looking for postdoctoral fellowships, Franco read an ad in the back of Science magazine about an opportunity to work for one of the leading experts in thyroid cancer, James Fagin, MD, at Memorial Sloan Kettering Cancer Center in New York. She got the fellowship in 2011 and worked with Fagin for four years, studying the disease she had been diagnosed with 12 years before. 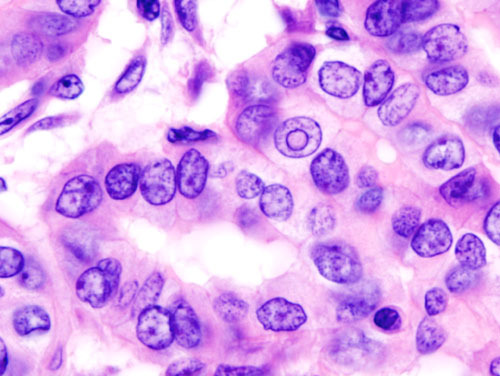 Histopatholgical image of papillary carcinoma of the thyroid gland obtained by a total thyroidectomy. Thyroid cancer is one of the few cancers for which incidence rates are increasing. This year alone, it is expected that more than 64,000 U.S. adults will be diagnosed with thyroid cancer and nearly 2,000 will die of the disease. While oncologists can treat many thyroid cancers with surgery and radiation, as they did with Franco’s, about 5 to 10 percent of thyroid tumors are refractory to most current treatments, and patients with these tumors have a median survival time of three years to as little as six months. Throughout Franco’s postdoctoral work at Memorial Sloan Kettering and now in her own lab at the University of Arkansas for Medical Sciences (UAMS), she has tried to understand the genetic differences between these two types of thyroid tumors. Franco’s UAMS lab investigates the role of oncogenes and hormones in the development of cancer. 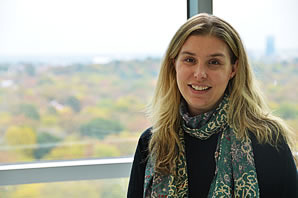 Her team is using a variety of mouse models and in vitro cell models that mimic thyroid cancer in humans to better understand how the disease initiates, progresses, and metastasizes. Her ultimate research goal is to develop better treatments for all types of thyroid cancer, as well as to learn more about how to prevent the disease. 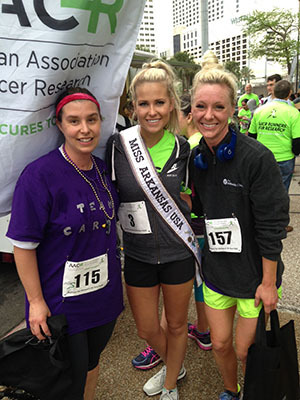 Aime Franco, PhD (left), with Miss Arkansas and a grad student in her lab after running the AACR Annual Meeting 2016 5K. Franco is passionate about her career goal to help ensure everyone has equal access to thyroid cancer treatments. Her work at Memorial Sloan Kettering particularly opened her eyes to the disparities that exist for people to receive care, whether because of race, socioeconomic status, or access to a cancer center versus a community health center. Part of her plan to reduce these disparities is to bring the community into her research – to educate them about what is being done to help thyroid cancer patients. To that end, Franco works with the UAMS Envoys program, which invites community groups to UAMS for monthly “lunch and learns” to showcase the institution’s work. She’s also a third-year mentor in the American Association for Cancer Research’s (AACR) Scientist↔Survivor Program (SSP). Through this program, which builds partnerships between leaders in the scientific and cancer advocate communities, Franco has guided groups of advocates at AACR’s largest scientific meeting, the AACR Annual Meeting, to help translate the science being presented in a more understandable way. “I learn more seeing the meeting through the eyes of the advocates than I do on my own,” said Franco. 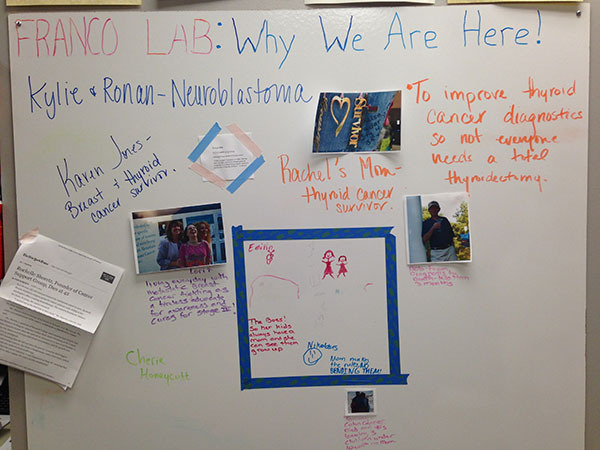 Franco has a whiteboard in her lab that reads “Why are we here?” It’s critical to her that everyone working in her lab can see the end game – that is, that they always keep the patients in mind. For more information about thyroid cancer, visit https://www.aacrfoundation.org/CancerTypes/Pages/Thyroid-Cancer.aspx.